Dark Horse Comics is hot to trot in July, with the launch of Jim Shooter's Doctor Solar, Man of the Atom, Predators movie tie-ins, and more. Of all the bit's and bobs on offer, here are three of the best covers lining up at the starters gate. 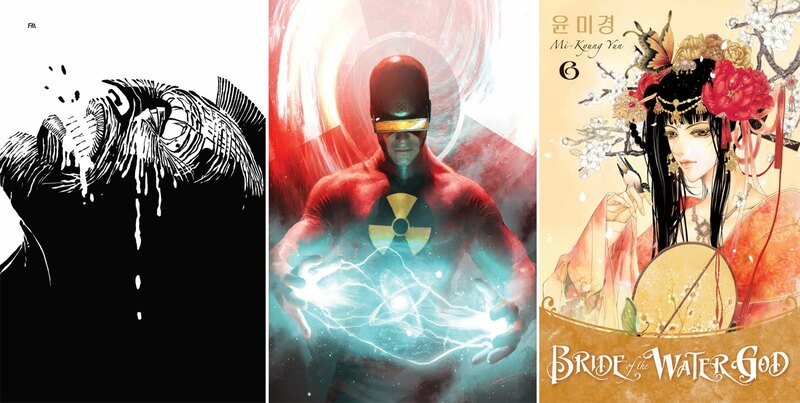 ARTIST AND TITLE: FRANK MILLER - Frank Miller's Sin City Volume 1: The Hard Goodbye 3rd Edition, MICHAEL KOMARCK - Doctor Solar, Man of the Atom #1, and MI-KYUNG YUN - Bride of the Water God Volume 6. For more info visit Dark Horse Comics.